I’ve been doing a LOT of decorating over the past few days, and to be honest, I’m still doing some tweaking here and there. I have several Christmas decorating blog posts coming up in the next few weeks, but today we’re going to start with an easy one: how to dress up cheap garland. I tried not to spend too much on Christmas decorating this year. I did add a few things (you’ll see those tomorrow! ), but I wanted to work with what we already had and just use it in new ways to make it feel fresh. That means the wreath and the garland on the mantel look a little fancier this year! Today’s blog post is part of the Merry & Bright Holiday Home Tour hosted by the lovely Kellie of Design Asylum and Shelly of ConfettiStyle. 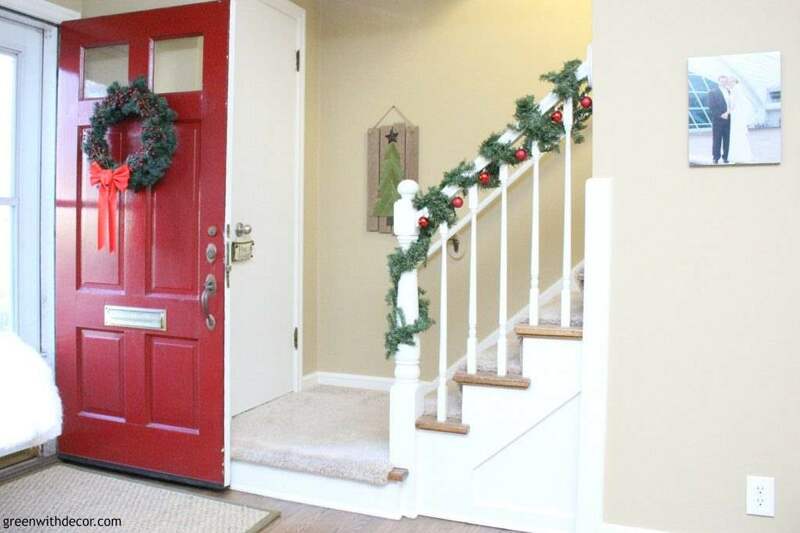 Be sure to hop around and visit the other bloggers on the Merry & Bright Holiday Home Tour. Links to all of them are below. You may remember what the front door and the mantel looked like last year? … and stuck them in the wreath. It took about five minutes. Doesn’t the wreath look a whole lot more dressed up?! As for the mantel, I added some red berries. I decided to mix it up this year and add them to the garland on the mantel. It gives the garland the perfect pop of red. I just love our wedding pictures on this window turned picture frame and can’t bring myself to take it down, even at Christmas. Our stairs looked a little plain last year, so I picked up a piece of unlit garland from At Home this year. For $5.99, I figured it was worth it! Don’t ya think? I hung some ornaments on it to dress it up a little. I used to decorate with more red in everyday decorating, but in the past year or so, I’ve transitioned into even more greens and neutrals than before. It’s making it so much fun to add pops of red to everything this season! Speaking of green and neutrals though, how fun is that wooden tree sign?! That’s another new addition this year. Are you decorating with garland this year? How are you dressing it up? Remember to hop over to the other Merry & Bright Holiday Home Tour ladies for more decorating inspiration! It looks so pretty, Meg! I’ve been all about adding little berries and ornaments from the dollar store this year. It’s amazing what a few dollars can do to dress up cheap garland! Thanks, Jenna! I know – I have ornaments and berries everywhere this year, and I’m loving the festive touches! Meg, Thanks for sharing all of these easy and inexpensive UpStyle tricks for your holiday decor. Everything looks great. I’m definitely heading out to buy some berry stems to add my some plain greenery I have. Thanks for the inspiration. Thanks for organizing such a fun blog hop, Shelly! The added berries add a nice festive touch! Love your warm home, Meg! Your wedding pic is so beautiful! Meg, i love this wreath! Thanks for the tip! Your mantel is lovely and your wedding pics are so sweet. Meg, I love this easy idea to spruce up faux greenery! So cute how you have your wedding photos displayed! I got two of those same wreath from Hobby Lobby but did not get at such a good price! I’m definitely pinning this! Meg, everything looks amazing! Love the berries. Such great tips! These ideas are SO pretty and festive, Meg! What great ways to dress up the greenery.